"Most star clusters in the Galactic disk disperse rapidly after their birth as they do not contain enough stars to create a deep gravitational potential well, or in other words, they do not have enough glue to keep them together. Even in the immediate solar neighborhood, there are, however, a few clusters with sufficient stellar mass to remain bound for several hundred million years. So, in principle, similar, large, stream-like remnants of clusters or associations should also be part of the Milky Way disk." says Stefan Meingast, lead author of the paper published in Astronomy & Astrophysics. 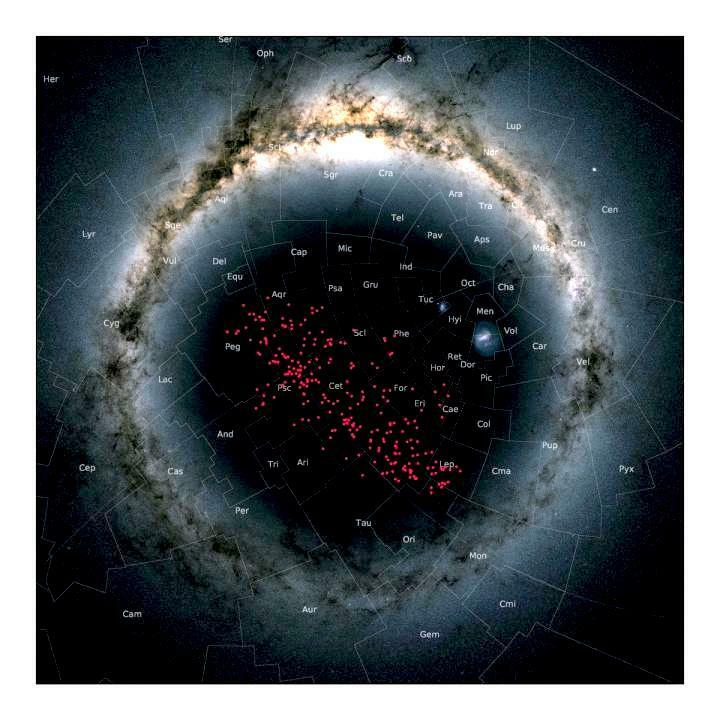 "Identifying nearby disk streams is like looking for the proverbial needle in a haystack. Astronomers have been looking at, and through, this new stream for a long time, as it covers most of the night sky, but only now realize it is there, and it is huge, and shockingly close to the Sun" says João Alves, second author of the paper. "Finding things close to home is very useful, it means they are not too faint nor too blurred for further detailed exploration, as astronomers dream." Due to sensitivity limitations of the Gaia observations, their selection only contained about 200 sources. An extrapolation beyond these limits suggests the stream should have at least 4000 stars, thereby making the structure more massive than most know clusters in the immediate solar neighborhood. The authors also determined the stream's age to be around one billion years. As such, it already has completed four full orbits around the Galaxy, enough time to develop the stream-like structure as a consequence of gravitational interaction with the Milky Way disk. "As soon as we investigated this particular group of stars in more detail, we knew that we had found what we were looking for: A coeval, stream-like structure, stretching for hundreds of parsecs across a third of the entire sky." Says Verena Fürnkranz, co-author and Masters student at the University of Vienna. "It was so thrilling to be part of a new discovery" she adds.